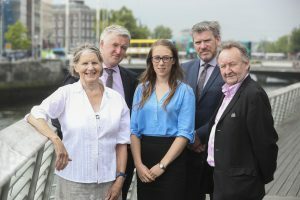 April Duff (centre) pictured at the ICCL/The Wheel/Front Line Defenders/Transparency International press conference on 6 July 2018 where she spoke about Education Equality’s interactions with Sipo in 2017. 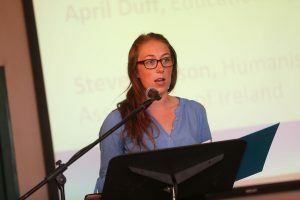 “To introduce the organisation: Education Equality is a small, voluntary human rights organisation that exists to campaign for equality for all people in the education system regardless of religious beliefs. We have 2 main goals: to secure equality of access to school places and to ensure that every child is equally respected during the school day regardless of their or their parents’ religious beliefs. Education Equality is a small, voluntary human rights organisation that exists to campaign for equality for all people in the education system regardless of religious beliefs. In 2015 a small number of individuals started meeting regularly… no organisation existed with the aim of campaigning for religious equality in schools. A number of us were parents who couldn’t get school places for their children. We were volunteers, we all had day jobs and families, but we felt we needed to get engaged. We were a group of people entering into public conversation on a national social issue. At no point were we involved in anything to do with elections or referenda. At the time we were forming we met with individuals from the Humanist Association who were glad we were forming, and they agreed to provide us with a grant to help us start off as we had no funds. We received 10,000 euro, split between 2015 and 2016. After we received the grant we operated independently, we didn’t have much contact with the Humanist Association. Out of the blue in January 2017 we got a communication from SIPO informing us they had been informed – it later transpired a complaint had been made against us – that we had received a donation for political purposes which exceeded the maximum of 2,500 euro, and that we might be in breach of the Electoral Act. Our response was of surprise but we weren’t particularly worried. 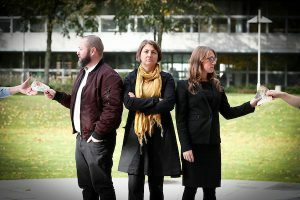 I’m a barrister and so is the treasurer, and we hadn’t imagined the Electoral Act could catch us. We thought it would be a simple matter of us clarifying that we hadn’t received donations for political purposes. This was not the case. 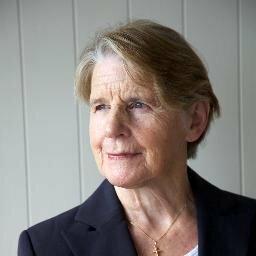 We engaged in a huge amount of correspondence with SIPO over months where we took the position that it was not a political donation, we hadn’t taken money for political purposes, we were seeking registration as a charity and thought it would be absurd if we were a charity and also considered political because under the Charities Act a charitable aim cannot be political. The correspondence detracted hugely from the work we were supposed to be doing. We were all volunteers, and it took a huge amount of our time and resources to decide how to react and maintain our line that we should be able to keep our funding. The emails from SIPO continuously referred to the fact that it was an offence under the legislation to refuse to comply, so we were a group of volunteers being constantly threatened with prosecution. It hampered our efforts at a time that was crucial in public debate because legislation was being put through. Eventually, unfortunately, in July 2017 SIPO came to a decision and directed that we were to return the funding we had received insofar as it had exceeded 2,500. Thankfully we just about had 5,500 in the account having not spent it. We had intended the funding would last for quite a time. I don’t know what would have happened if we hadn’t had it, whether we’d be personally liable. It has meant we now have no funding. We decided to dissolve and transfer to a company limited by guarantee to give personal protection, and now we don’t accept donations exceeding 100 euro from anyone because we don’t want to have to register with SIPO while we’re registering for charitable status. It means we’re running on no funding. Thankfully because we’re volunteers we can do a massive amount without funds but there are expenses – website, a GDPR compliant database of members. We need to be able to hire venues, to inform the public and raise awareness.